Fruit filled Chelsea Buns are a delicious treat, especially when they’re still warm from the oven. Chelsea Buns are made with an enriched yeast dough enhanced with butter, eggs, sugar and milk to make them rich and pillowy soft. 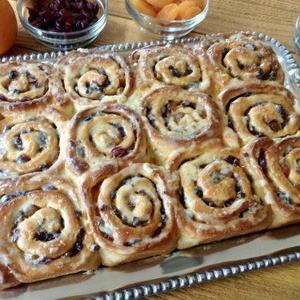 These sweet buns are traditionally filled with currants; however, this recipe adds additional fruitiness with cranberries and apricots along with the currants. After baking the buns are covered with a warm apricot glaze and orange icing. This Chelsea Bun recipe is adapted from Paul Hollywood’s recipe that was shown on the Great British Baking Show Masterclass. I made only minor tweaks such as steaming the fruit, adapting the topping ingredients, and converting to American measurements. But if you’d like a more exact recipe I’ve also included Paul’s measurements in the list of ingredients.